It doesn’t take a genius to realize that we’re living in a world full of signs and symbols. These signs and symbols serve several functions: they guide our actions, warn us about potential dangers, among many other purposes. As a society we are moving rather quickly into a visual-driven culture. Cultural studies scholars, rhetoricians, and researchers from arts, history, anthropology, and even philosophy are interested in how citizens of the 21st century world negotiate meanings, locate information, and connect with one another through various visual means and technology. In a writing class, it might sound silly at first to make visuality as one of the main learning units. But one would soon realize that we cannot detach the visual from the composing process (which is often only thought of as only textual). Take for instance when one writes using a word processor on the computer: the writer is constantly influenced by the tools, functions, the constraints of the “page,” and other visual aspects presented on the writing platform. An immediate example to turn to is the blogosphere. Blogging spaces providers have, over the years, made significant improvements to their writing dashboards so to give writers a more comfortable canvas to write. They do so by carefully crafting the look and feel of the writing interface; some even remove action buttons and toolbars altogether to give bloggers a distraction-free writing zone. Given my interests in visual culture and rhetoric, the third unit of my University Writing course is dedicated to exploring the roles and impacts of visual composition in the realm of persuasion. My aim is to facilitate discussions on how meanings are/get constructed via visual design and arrangements. One easy, and perhaps most important, element to go to is color. One can think of so much impact colors have on our lives and how we relate to colors. To explore the role of colors in visual composition, I introduced an activity called the color association exercise, inspired by a professor in my PhD visual rhetoric seminar. This activity is simple yet fun and engaging. Break students into groups of 2-3. Ask each group to generate as many associations (things, events, people, emotions, etc.) as possible with their assigned color. After few minutes, ask each group to finalize their top 2 or 3 associations for the color. Have the students report back to the class as a whole. 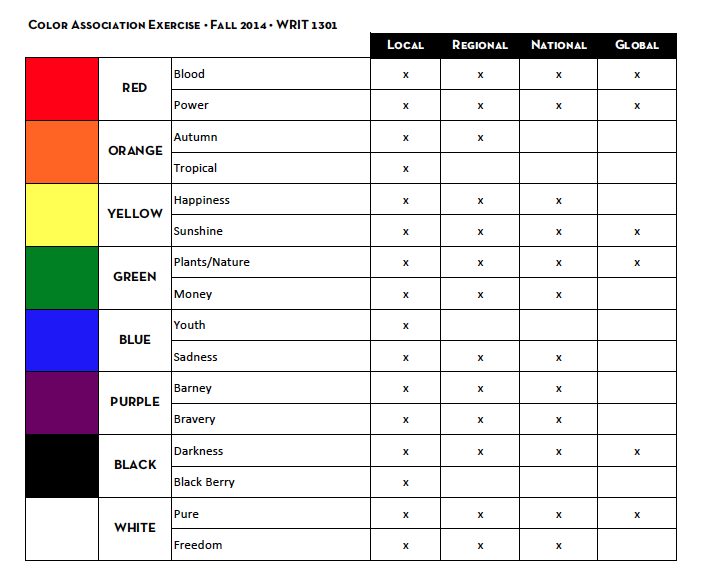 The instructor may pull up a spreadsheet (as below) to fill out the chosen top associations as students report them. Ask the class if each color meaning they came up with is identified by local, regional, national, or global citizens. As the instructor moves down the table, discuss why some color meanings are hard to decide their relevance to a larger population. Below is a snapshot of the table generated in my class today. It serves as a springboard to a fruitful conversation on how we perceive colors, consciously or otherwise, to generate meanings in life. As my students are working on a visual analysis project, this activity sought to expose them to different ways of looking at images — a rather more critical perspective on how images are composed to make certain arguments. As I am deeply intrigued by how visuals are woven into our daily discourses – public speeches, PR events, advertisements, telecommunications – I think visual literacy has become an importance part of verbal and intellectual development to allow us deeper understandings of representation and meanings.